2019 PUMA CHAMPIONS CUP , APRIL 12th-14th ALL GAMES HAVE BEEN CANCELLED AS OF 10:45AM. Schedules are posted and may be found by clicking the logo. We have 485 teams participating this weekend. All of our fields are completely full on Saturday and Sunday so if you have a conflict please find an assistant coach to help. Inclement Weather Procedures: Please make sure all team contact information is current on gotsoccer with the attending coaches and managers. If any weather issues arise we will send updates as soon as we have them to the team contacts listed as well as post here. SUNDAY GAME CHANGES: All games shortened 5 mins per half. All playoffs besides 4 brackets have been cancelled. Trophies will be awarded by points. Trophies will be awarded at SC1 and SC2 only. If your last game is at RVC and you advance please go to SC2 for your awards. PLEASE CHECK YOUR SCHEDULES AS SOME FIELDS HAVE CHANGED - GOTSOCCER IS CORRECT. RICHMOND, VA (March 20, 2019) – The Boys Elite Clubs National League (Boys ECNL) is excited to unveil a significant class of nationally-renowned clubs joining the rapidly growing youth platform for the 2019-2020 season, including the creation of a new conference. Former Raptor wins NCCAA National Championship. Former Raptors player Lexi Zambrano attends and plays college at Trinity Christian College. her team just won the NCCAA Division 1 National Championship. 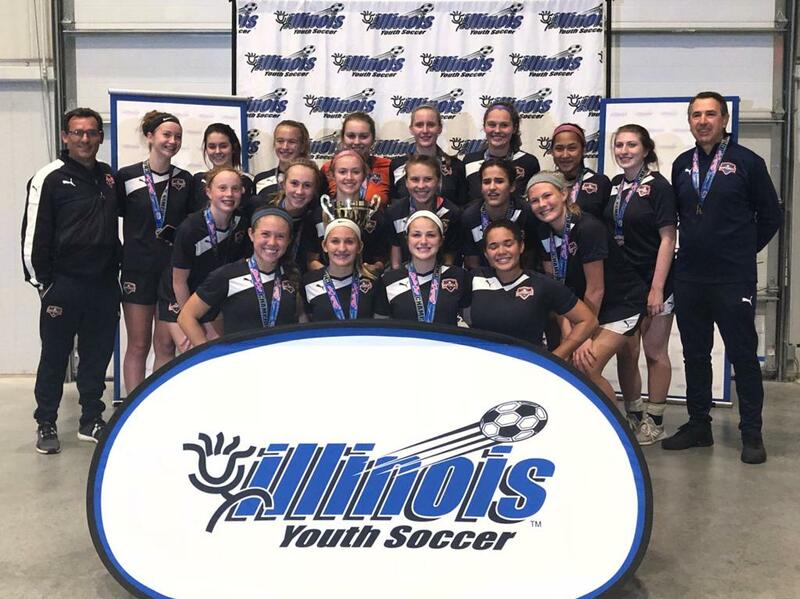 The Raptors U17 Girls team beat Crystal Lake Force Elite+ 3-2 after extra time in the State Cup Final. The team will now compete in the US Youth Soccer Midwest Regional Championships in Saginaw, MI on June 21st thru 26th, 2019. The 2008 Girls team coached by Jason Parsons won the Halloween Havoc tournament in St.Louis , October 26-28th. Colin Beatty, Isaac Brown, CJ Couper, Roberto Davila, Bernardo Dominguez, Alexis Garcia., Cooper Jevremovic, Carson Masters, Alan Rubio, Sebastian Sepulveda, Evan Theien, Aidan Westerberg. Click the Link Below to watch our 05 Boys take on the top clubs in Europe! Want to join the Raptors Club? Are you interested in joining the Rockford Raptors and missed tryouts? It may not be too late! Please contact one of our Directors for information. Rockford Raptors Boys 04 Select are IL Cup Semi-Finals after falling to Fox Valley Bayern FVBM in PKs after a 1-1 regulation and Overtime. U-17 Boys compete at the Players College Showcase in Las Vegas, NV. The U-17 Boys played in the Players College Showcase in Las Vegas , NV on March 9th thru 11th. They beat Beach FC (CA) 1-0, Temecula Valley SC (CA) 3-0 and lost 1-3 to Davis Legacy (CA), finishing 2nd in their bracket. Everyone at the Raptors congratulates Frank on this great achievement. Raptors FC Offers Three Levels of Programs - Which is Best for Your Child? Please see below for the Raptors FC outline of programs available for yor child. Contact us with any questions you may have. •More than 300 former Raptor Players have gone on to play at the College level. •Entire Coaching staff is certified and licensed while more Raptors Coaches hold advanced diploma‘s and more Licensed "A" coaches than any other local club. •Average tenure for a Raptors Coach is more than 6 years with the Club and many have been with the Club since the inception. •Establishedin 1994 as one professional team in the former USISL (now called USL, a second divisionleague below MLS) with the help of Dr. Wedgbury and established Youth system shortly thereafter. Doing so with the sole purpose of creating quality soccer training opportunity for Rockford’s youth. Later was the backing for establishing ISC and Sportscore Two as The premier Soccer Facility in the Country. •Annually provides more than $70,000 in scholarships and financial aid for players. •ONLY Local Club that have participated in MRL (boys & Girls) since its inception. •Established and continues to host one of the most successful and sought after tournaments in the Midwest and Country as The Puma Cup hosts more than 680 teams annually over 2 weekends in April. •Established and hired a Full-time Professional Athletic Trainer. To continue to raise and set the bar for other Clubs to try and copy but not duplicate. The ONLY local Club to do so.